A quick and easy recipe that is bursting with flavour and colours, perfect for any evening meal of the week. In a bowl, combine the minced beef with the tomato puree and the spice mix. Then, to prepare the tomato salsa, in a small bowl, combine the tomato, red onion, garlic clove, coriander. Add a squeeze of lime juice and stir to combine. Cover and keep aside at room temperature until ready to serve. Then, heat a large sauté pan over high heat. Drizzle the olive oil and add the beef mixture. Season with salt and pepper and Cook for 8-10 minutes until caramelised and cooked through. Use a spatula to breakdown the large pieces of minced beef into small pieces if needed. 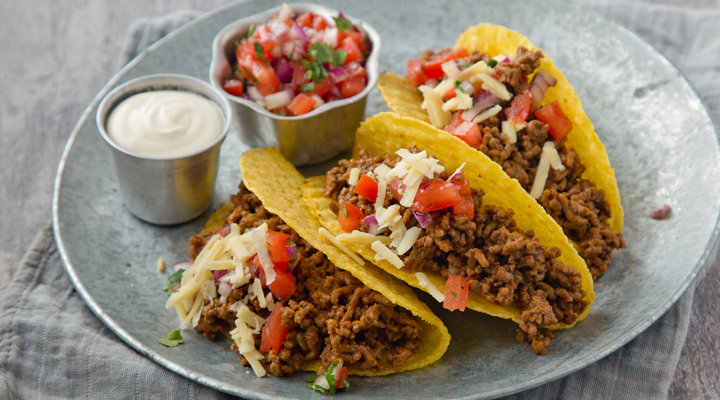 To serve, warm the taco shells, add some beef mixture, top with some salsa and grated cheese. Serve with the rest of the salsa and sour cream.